webcam is shown reversed in msn ??? Thread: webcam is shown reversed in msn ??? but in msn itself chatting with someone, is mirrored. any text i try to show to the cam is shown reversed. weirder yet, is i had the lifecam driver v3.0 installed. i just removed it 10mins ago, and it still works in msn but still reversed. Last edited by h0rnytoad1; 29th January 2010 at 04:40.
hi, ty for replying so quickly. i don't see the any setting to reverse this on the audio video wizard on msn. its just my usual webcam settings. zoom , color balance, etc. but no mirror or inverse or reverse checkbox or button. but plz understand that this problem ONLY occurs on wlm, not websites that use cam not other IMs (yahoo's works fine) JUST wlm. 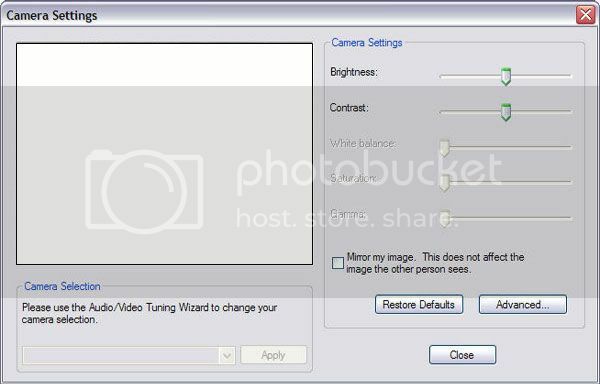 In Windows Live Mesenger camera settings you should get this window. On the bottom left from the drop down list choose your cam and not "default" and apply. Untick Mirror My Image on the right side of the window and close. hi ty for a quick reply. mine doesn't have this setting. i can't find a camera setting in any menu, except the audio video wizard. here's the screenshot. i have no other way of changing this. even the lifecam driver doesn't show anything else. Last edited by h0rnytoad1; 30th January 2010 at 02:31.
webcamsettings on Flickr - Photo Sharing! What are the options under the "Control de la camera" tab? webcamsettings2 on Flickr - Photo Sharing! As riteshtechie mentioned above, it's really strange, I have just installed the latest wlm and the mirror option is no longer there as it was in previous versions, so it's probably correct to assume the problem lies within the live cam settings and has nothing to do with wlm. Sorry I don't use a live cam so I can't get into the settings to delve deeper. there is no more deeper setting, this is all there is i think. the lifecam software itself only allows to take snapshots and videos and overlay cute stencils on the camera. if anyone has contact at microsoft tell em to bring it back plz. Last edited by h0rnytoad1; 30th January 2010 at 08:55.